Through the SESAR Programme, A6 Alliance members have identified, and are developing and deploying, new operational concepts and technologies that are fundamental to delivering the Single European Sky objectives. We have played a crucial role since the inception of the SESAR programme and now through SESAR 2020, the current phase of SESAR R&D, developing high-performing operational and technological solutions for the aviation industry. The programme supports projects developing and validating concepts in five key areas: airport operations, network operations, air traffic services, technology enablers and, ultimately, U-space drone traffic management. The A6 Alliance has played a key role contributing to the development of many mature, validated solutions which are now being implemented. Delivering value: In 2019 SESAR projects are expected to save 363,000 delay minutes, worth some 10 million Euro. SES Digital Backbone: The A6 Alliance and EUROCONTROL have launched the SES Digital Backbone (SDB) initiative. 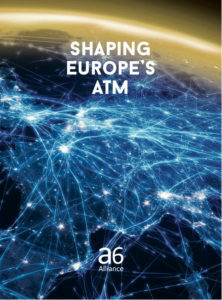 The idea is to establish an over-arching governance framework of operational stakeholders, the SES Shared Services Alliance (3SA) to manage the multiple and essential data and information exchange components necessary for end-to-end digitalization of European ATM. It can deliver benefits including a common safe and cyber secure context for all data access components, encouraging better sharing and use of information through a common trustworthy platform and improving interoperability. The SDB is a ground-breaking initiative, and an important first step to achieving the pre-requisites set out in the SESAR JU’s Airspace Architecture Study. The A6 Alliance and EUROCONTROL are working jointly with the SDM on the organisation of a “Kick-Off Workshop on the SES Digital Backbone and its Governance” on 5th April, addressed to all Operational Stakeholders. U-Space: The A6 Alliance is at the leading edge of the emerging environment of U-Space, using their current capabilities and competencies and preparing solutions that would satisfy drone operators and at the same time the safety of manned aviation operating within the same airspace.